A wind resistant patio umbrella is not just about a type of outdoor umbrella, but also about how you care and store your umbrella. We have found our umbrellas not once, but several times in the pool and with cracked ribs. 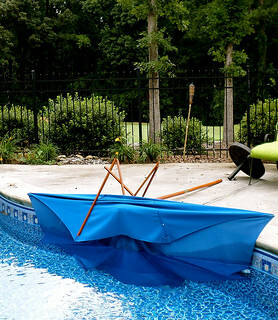 Here is what we've learned about wind and patio umbrellas. Most umbrella owners have experienced that unexpected gust of wind or sudden storm that has damaged the umbrella, cracked the ribs or sent it flying. 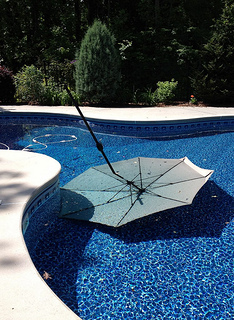 This can happen if you put your umbrella in a patio umbrella table but neglect to secure it in an umbrella base. 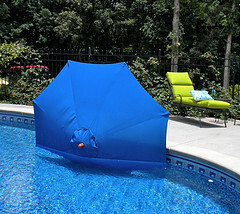 That same umbrella in the pool picture you see above is the result of NOT keeping it in an outdoor umbrella stand. You can see pictured below that we had it sitting in the hole of a patio table - but not in a base. It is important that you select the right size patio umbrella stand so that the wind doesn't blow the umbrella out of the base. 2. Where the umbrella will be used in a patio table or freestanding. Free standing umbrellas require heavier bases. 100+ lbs will support any free standing umbrella. They are not normally used with tables. 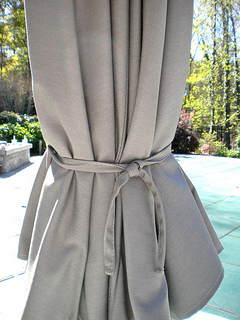 Add extra weight to your new or existing patio umbrella base with a weighted bag. The heavy duty stitching and canvas make this durable bag an easy way to add extra weight = up to 85# by adding sand or gravel in the bag. A velcro enclosure makes it easy to open and close. While fiberglass ribs are stronger than aluminum, an aluminum patio umbrella frame is much stronger than a wood one. 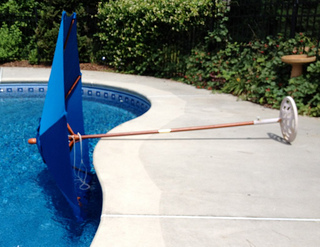 Our aluminum outdoor umbrella has yes, blown into the pool, but with no damage to the umbrella or the pool lining. That's usually not the case for a wood market umbrella. My two neighbors as well as my daughter have all experienced gusts of wind that have caused the ribs to break or crack on their wood market umbrellas. The ultimate wind resistant patio umbrella uses flexible fiberglass ribs to absorb wind gusts without breaking rather than traditional wood or aluminum ribs. These fiberglass ribs are very strong, but also very flexible. This means that they last much longer than the normal wood or steel ribbed umbrellas. The Fiber built ribs have been tested in winds over 50 mph. They are 4 times stronger and up to 30% lighter than traditional wood or metal ribs. Always use an outdoor umbrella stand for all of your patio umbrellas. This is very elementary, but yes you do need an outdoor umbrella stand to hold your patio umbrella - even if it is supported by an outdoor patio table. 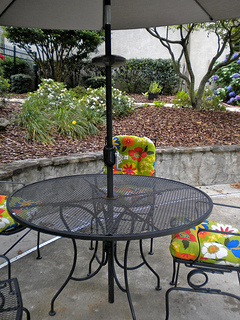 A patio umbrella that is not stabilized by a table requires a heavier umbrella stand. This beautiful blue outdoor umbrella was such a good deal and I needed one next to our wrought iron chaise lounge. After placing it into an umbrella base that we already owned, the weight of this cast iron umbrella stand, was clearly not enough to keep the umbrella from tipping over. You can also prevent damage to your umbrella just by closing it when not in use and tying it for extra protection. Our Sunbrella patio umbrella came with nice ties so we do tie it up when we close it. Our other outdoor umbrella did not come with any ties. In this case it is a good idea to use a patio umbrella bungee cord. 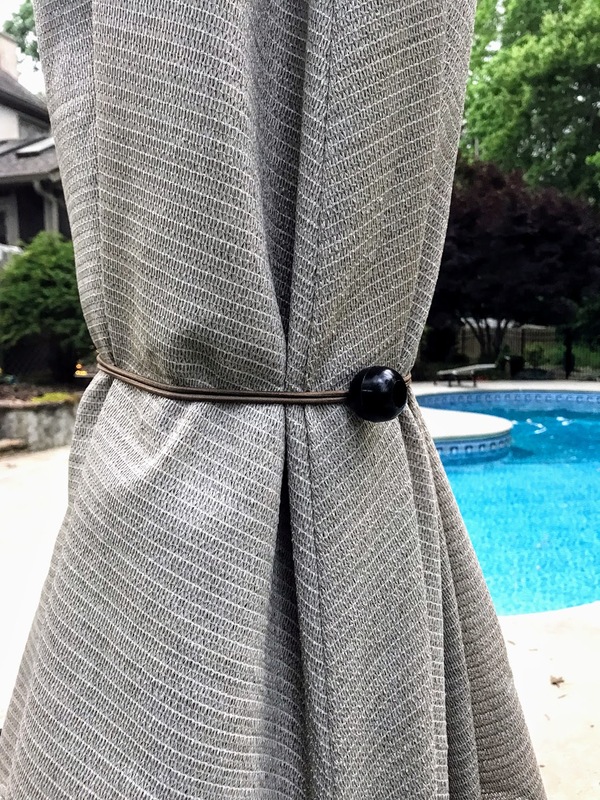 Close your umbrella and place the bungee cord around the fabric to protect your umbrella and keep it from being blown away by the wind. Use stronger aluminum frame and fiberglass ribs rather than a wood market umbrella. Also choose one that has vents on the top to let air blow through. This one from Amazon has been wind tested at 50 MPH. Flexible fiberglass ribs are their best feature.